The classic bestselling resource for every American home. 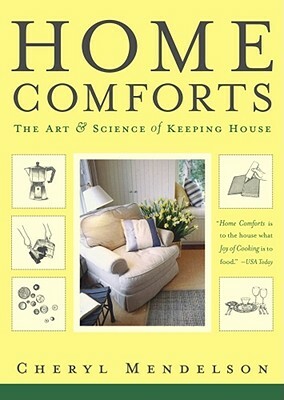 Choosing fabrics, cleaning china, keeping the piano in tune, making a good fire, folding a fitted sheet, setting the dining room table, keeping surfaces free of food pathogens, watering plants, removing stains -- Home Comforts addresses the meanings as well as the methods of hands -- on housekeeping to help you manage everyday chores, find creative solutions to modern domestic dilemmas, and enhance the experience of life at home. Further topics include: Making up a bed with hospital corners, Expert recommendations for safe food storage, Reading care labels (and sometimes carefully disregarding them), Keeping your home free of dust mites and other allergens, Home safety and security, A summary of laws applicable to the home, including privacy, accident liability, contracts, and domestic employees and more in this practical, good-humored, historic, philosophical, even romantic, guidebook to the art of household management. Cheryl Mendelson is a Harvard Law School graduate, a sometime philosophy professor, a novelist (Morningside Heights and Love, Work, Children), and a homemaker by choice. Born into a rural family in Greene County, Pennsylvania, she now lives in New York City with her husband and son. "The bible of good housekeeping." "Home Comforts is to the house what Joy of Cooking is to food." "There's only one book to own if you want to be serious about your housekeeping: Cheryl Mendelson's magesterial HOME COMFORTS."